Omar Ali Saifuddien Mosque comes up as #1 place to visit when in Brunei. From a distance, it might look like just another mosque but it is NOT. Omar Ali Saifuddien mosque's main dome is covered with pure gold. 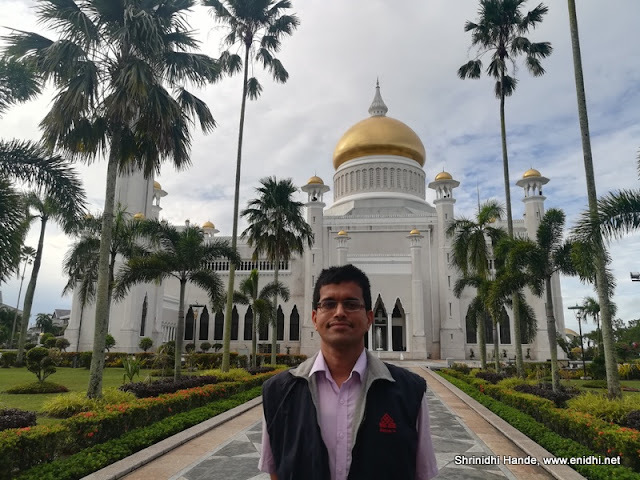 The 52 meter high dome is visible from most parts of Bandar Seri Begawan, the city centre area in Brunei as there're not too many high rise buildings in Brunei. I paid a quick visit to Omar Ali Saifuddien Mosque- as we entered through the main gate it was not clear if we are allowed to enter (being non-muslims) and if there're any restrictions. Some locals nearby told us we can enter, after removing shows and are not allowed to take photographs inside. Thus we entered on barefoot. The interiors are nice- it is not as huge as some of the mosques or churches you might have seen elsewhere- area wise it is about the size of a tennis court I guess-may be a bit bigger. Entry to upstairs is prohibited, roof has nice paintings. Nothing much to see or do inside. You can sit and pray if you wish to. Thus after spending about 10 mins we came out. On the other side of the mosque is a small artificial lake with a fake boat. Gives a photogenic add-on to the mosque. Omar Ali Saifuddien Mosque is built in 1958 and boasts of a Mughal architecture with Malay influence. That's a very pretty mosque..